Incorporates various print modes suitable for any work, ranging from high-speed print with a maximum rate of 135 sqm/h (1,453 sq.ft/h) to practical quality print with output speed of 50 sqm/h (538 sq.ft/h) and finally, quality-oriented enhanced picture quality print speed of 31 sqm/h (333 sq. ft/h). The practical quality mode achieves approximately 130% (*4) higher productivity in comparison with our conventional model (TS300P-1800). This is a feeding unit to load [Mimaki Vision Jet-X] transfer paper with a length of about 2,500m (8,202 ft). Reduces the cost per square meter and shortens the downtime due to media replacement in comparison to smaller transfer paper rolls. 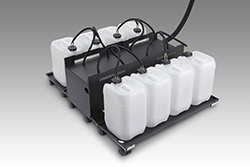 This is an ink supply unit to set a 10kg (22 lb) ink tank for a single color. 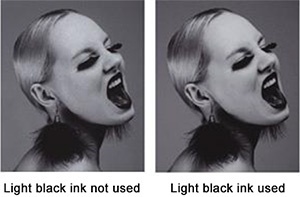 Compared with the conventional 2L ink pack, the running cost is much reduced and the downtime due to ink replacement is shortened. This is an extended heater installed to the lower part of the standard heater. 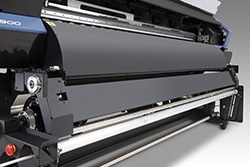 The heater enhances the ink-drying capability and prevents the "blocking" of medium (caused by still wet ink obstructing the feeding of the media during high-speed print), thus ensuring stable production. The "MAPS" functionality providing gradation to printed pass boundaries maintains stable print quality by reducing banding and uneven color. The "TS55-1800" equipped with newly developed heads enables the "MAPS" in the high-speed mode, which has been unavailable so far. The technology allows the simultaneous pursuit of both high speed and high quality. * An 8-bit rendering is used depending on the file format or color space. The RIP process for multiple pieces of print data can be performed in parallel. In addition, thanks to the load balancing function for print jobs, jobs can be assigned to printers automatically, allowing efficient production when multiple printers are connected (*). * Additional printer licenses corresponding to the number of connected printers are required. RIP processes can be performed in parallel, making production that uses multiple printers efficient. The parallel processing capability can handle up to 8 jobs. Automatically allocates* print jobs to multiple units of same printer model. Variable data such as uniform numbers and player names can be directly imported from CSV file to create print jobs. Text can also be processed using methods such as text outline fills and arched text layout. Light black ink enables stunning gray-scale expression. Because sublimation transfer print uses a high-density black ink, graininess or tone jump may occur in some cases. Light black ink adds to smooth print expression without graininess or tone jump. Fluorescent inks enable unique expression. 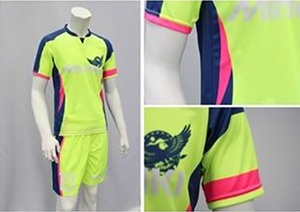 The demand for fluorescent inks is rising in products such as uniforms and other sports apparel, fashion apparel representing Japanese cute pop culture, and eye-catching bright soft signage. To use fluorescent inks as the complementary colors of process colors, not to mention as spot colors, a multi-color mode (*) is provided. The fluorescent inks complement magenta and yellow to realize brighter colors. 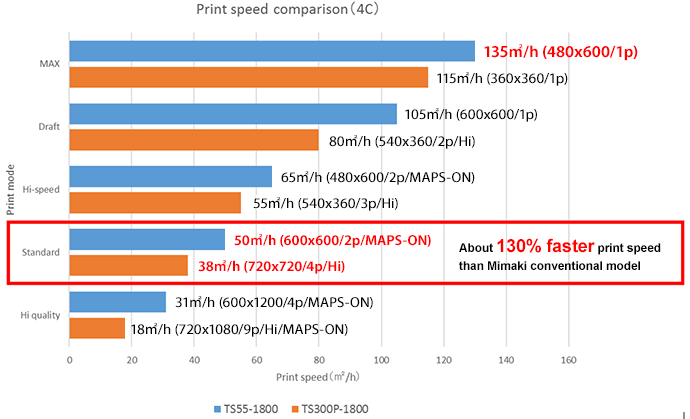 Transfer paper enabling long-time continuous operation -- "Mimaki Vision Jet-X"
"Mimaki Vision Jet-X" mini jumbo rolls featuring approximately 2,500 meters (8,202 ft) of transfer paper is scheduled for announcement concurrently with model "TS55-1800". When running the "TS55-1800" printer at its maximum speed (140 sqm/h; 1,506 sq.ft/h), a 150 meter (492 ft) roll of transfer paper runs out in approximately 2 hours. The system was therefore incapable of coping with extended continuous operation such as overnight printing in the absence of operators. The combination of "Mimaki Vision Jet-X” and the mini jumbo roll allows for unattended printing for a long time. 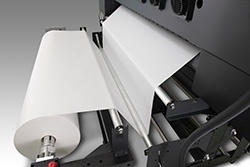 The mini jumbo roll also contributes to reducing the running cost with lower paper costs per square meter in comparison to normal plotter rolls. TxLink4 Lite or RasterLink6Plus is bundled according to user's request.